How to Use SynciOS Mobile Manager? Syncios Manager offers ultimate file transfer solution between iOS & Android and PC, helping you easily transfer and backup multimedia data including music, video, photo, Ebook, apps, contacts, notes between iPod/iPhone/iPad/Android and Computer. There are more functions of Syncios to better manage your iOS & Android devices, such as Access iOS file system, iTunes backup extractor, etc. Simply connect your iPad/iPhone/iPod/Android to windows PC with USB calbe. Transfer all files including music, video, photos, contacts, ringtone, ebooks, Podcasts, audiobooks, TV Shows, MV, voice memos, iTunes U between iPad/iPhone/iPod and PC. 1. Under My Device tab, choose items to manage from the left panel: Media, Photos, Ebook, Apps and Information. 2. Choose the operation to backup data from iDevices to PC or copy from PC to iPad/iPhone/iPod without iTunes. 1. Click Online Videos tab, click Add URL(s) button and paste online video URL to the pop-out box. Use Enter key to put each URL on a new line. 2. Click Start Download! 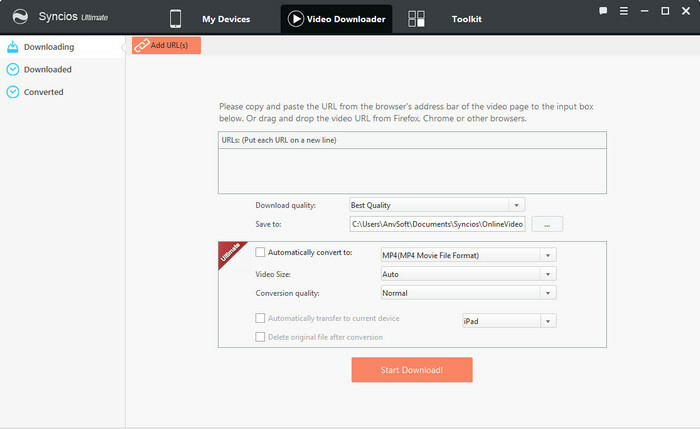 button, choose video download format and start downloading. 3. Wait until the video downloading finished and it would display under the Downloaded list. 4. Check downloaded online videos you would like to convert and transfer to your device. Hold down the Ctrl/Shift key to select multiple video files. 5. Click Convert button. Choose output video format and video conversion output location. If you would like to transfer video to connected device automatically, simply check the option: Transfer to device after conversion. 6. Click Convert button to start the video conversion process.